Los Angeles based Justin Liebow was in Cincinnati recently to direct a commercial for LasikPlus. Prior to his visit, his vision of the city was not so rosy. However, this trip shed some new light in his eyes about Cincinnati. Justin loved the city’s old architecture, especially Over-the-Rhine; the city’s many, fine restaurants; and his stay at the 21C Museum Hotel was a very pleasant experience. Although it was really cold when he was in Cincinnati, he saw beauty in Cincinnati’s snow-covered streets. 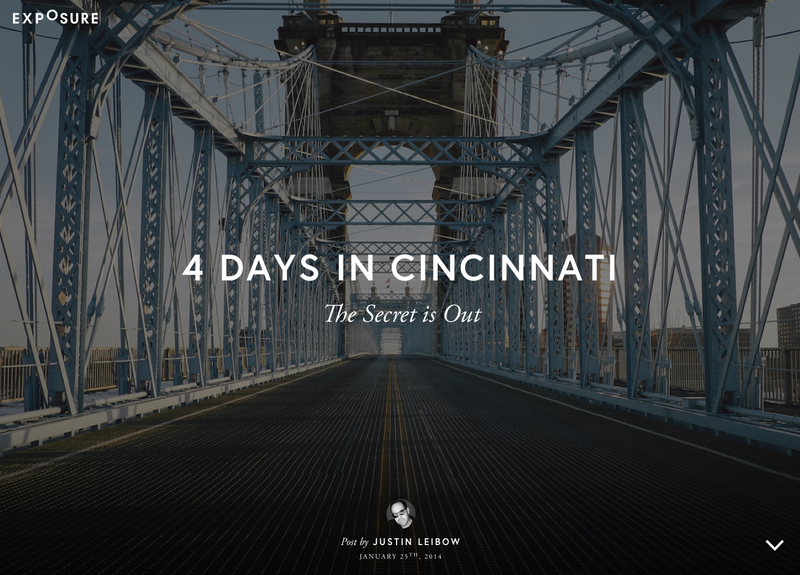 As a retrospect, Justin created a composite of photographs of the city and added his comments called: 4 Days in Cincinnati – The Secret Is Out. His camera captured some magical images. This entry was posted in Communities and tagged 4 Days in Cincinnati - The Secret Is Out, Cincinnati, Justin Liebow, Ohio photos by susanaknabe. Bookmark the permalink. Thanks for posting this story. It is very interesting to see through the eyes of others as they they discover the a town of interest beauty that we are lucky enough to call home but, can take for granted at times.